Looking back in future years I want to remember that it was hot hot hot hot hot yesterday. It was as hot or hotter than Malaga and the holiday island of Rhodes. Hottest day of the year so far. Some fab photos here. We left home at 1130 (quite late as we got up at 930) and were at Jenny's by 12:50. We were visiting her and Edward on the way to my Aunt's house. Aaron spent the whole bus journey in the pushchair, which is saying something as I'd normally need to take him out and put him in the wrap. At one point he got a bit grizzly so I gave him a toy - happy! 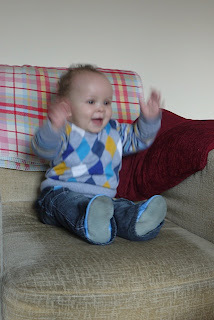 Then next time, gave him an Organix rice cracker, which always works - happy! Edward and Aaron played together very well, with Edward putting the rings on a stalk that Aaron was holding. They seemed happy holding half of the toy each and were both more vocal than normal like they were chatting to each other. Well just like our sitting room was like an oven before we left, theirs was too, and even though I thought it was something that I'd come out without a jacket, I even had to take my cardi off. 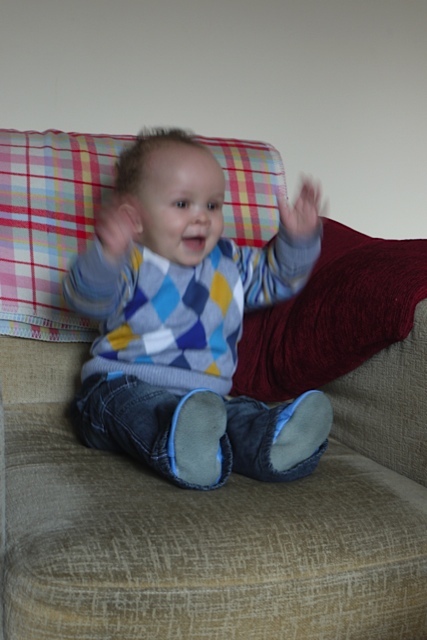 This is a picture Jenny took for us, which shows Aaron on her armchair. So sweet to see him sitting up by himself - it's still a novelty for me. Only shame was that when we went to my Aunt's we didn't think to go in her garden. By the time I suggested it, the sun had gone round the wrong side of the garden. But it was lovely to see her holding Aaron etc... we had a lovely day. Only trouble was, Aaron missed his morning nap, and when we put him down for his afternoon nap, he only slept for 35 minutes. I thought it would mean he'd go to bed early but it was 11 p.m. when I got him to sleeep... no wonder we got up at 930 today.... Someone once told me "sleep promotes sleep" and I think it's true, because he goes to bed earlier when he has his proper naps. Not sure what we'll do today. Still hot, but overcast. It's a shame that we've gone back to our usual of getting up at 930 (today = 3rd day in a row), as the last couple of weeks we'd been getting up at 730 which I was glad about as I wanted to prepare Aaron for me going back to work.